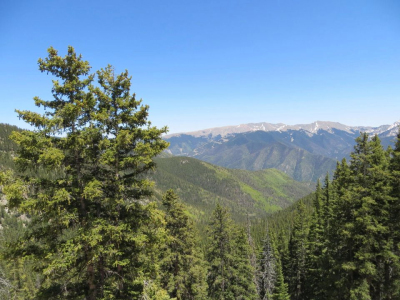 There are an abundance of hiking and XC ski trails in the Taos area. Pick up a copy of “Day Hikes in the Taos Area” by Kay Matthews for detailed hiking and XC ski trails in the Taos Area. 1) If you have an hour or two, head out to the rest area past the Rio Grande Gorge Bridge, and hike or bike along the West Rim trail: It's easy, do as long or short a loop trail as you wish, spectacular views are your reward. Some 25 miles or minutes north of Taos, it's at the confluence of the Rio Grande River and Red River. Great camp sites, easy or strenuous hiking down into the gorge, a great loop trail (5.5 miles) for easy hiking or biking – all away from the crowds. It's one of our favorite places in the whole area. You may want to be adventurous and try out the Black Rock Hot Springs outside of Arroyo Hondo (get directions from locals to find it). The rates are very reasonable, and make sure not to miss the "Milagro Relaxation Wrap" after your soak: 25 minutes for $12 – it's worth every penny of it! This is our own custom tailored "Experience New Mexico at its best" drive around Taos. You can do it in 2 to 3 hours, but much better would be planning on 3 to 4 hours, or even more. Head north on US 64. At the "old blinking light" (which is now the big intersection of US 64, Hwy 522, and 150), take a right turn onto Hwy 150, heading for the Taos Ski Valley. In Arroyo Seco, take a left turn right at the "Abominable Snowmansion". You're now on the "Hondo-Seco" Road. Very soon you come to Hwy 230: cross it, and continue south on the Hondo Seco Road. It drops down, leads back to the left, until eventually you reach the main Highway again (522). Take a left turn back to Taos, and you'll be back at the the "old blinking light" in no time. This time, take a right turn, onto US 64. Drive 7 miles to the Rio Grande Gorge. Stop after the bridge and walk on the side of the road to the middle of the bridge or so, so that you'll get the feel for the incredible depth. Hop back into your car and stop on your left at the rest area: it has a spectacular view back to the gorge and you can take an easy 15 minute walk to the bench on the west rim trail. Continue on about 4/10 of a mile after the bridge – where there is a sign on the right side of the road says "Pilar, Ojo Caliente", take a left turn onto the newly paved Rim Road. Drive about 6 to 8 miles on that road, parallel to the gorge, until you hit the T-Junction. Take a LEFT turn down to Pilar - slow down, and be careful: before you know it, it's a dirt road, and it drops down, rather steep, all the way down into the gorge! It's a breathtaking drive. No worries, you don't need a 4 wheel drive. When you reach the river, there are camp sites, picnic areas (have you brought your lunch? ), and then, turn to your right and follow the river (it is paved again now) all the way to Pilar, where you intersect with the main Highway (68). Take a left turn, and before you know it, you're almost back in Taos.